Shopping for the cheapest solid-state Thunderbolt 3 external SSD backup drive for Mac or PC use? Patriot recently threw down the low-price gauntlet with it's EVLVR line of Mac compatible external 512GB and 1TB Thunderbolt 3 SSD storage devices. Price competition is heating up as more computer storage companies enter the emerging market for Thunderbolt 3 peripherals. 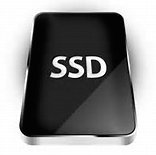 As flash memory prices continue their downward slide, it's making SSD storage in general downright cheap. 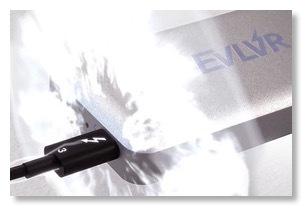 Offering Read speeds up to 1600Mbps and 1000Mbps Writes, the EVLVR from Patriot Memory isn't quite as fast as some competitor's PCIe SSD blade products that cost significantly more. So there's the tradeoff: A cheap Thunderbolt 3 SSD that's more than 'fast enough', or far more expensive ones that deliver proportionately higher speeds at higher prices. Licensing Intel's Thunderbolt 3 chipset inflates the cost of computer peripherals significantly more than a dirt-cheap USB 3.0 / 3.1 chipset does. But Thunderbolt 3 is taking hold far beyond the Mac into the Windows PC world with unprecedented adoption and deployment. The economies of scale with make cheap Thunderbolt 3 storage and devices a reality sooner than you think.